Hello! 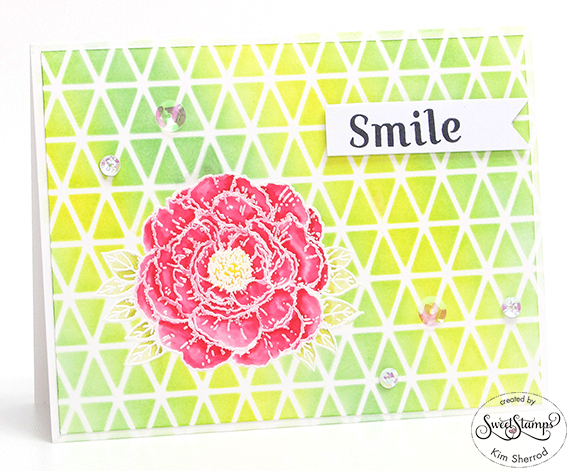 Kim here to share with you a card using The Cabbage Rose and Keep Calm stamp set. I am also using the Tangrams Art Stencil to create my background. I embossed the Cabbage Rose using white embossing powder. 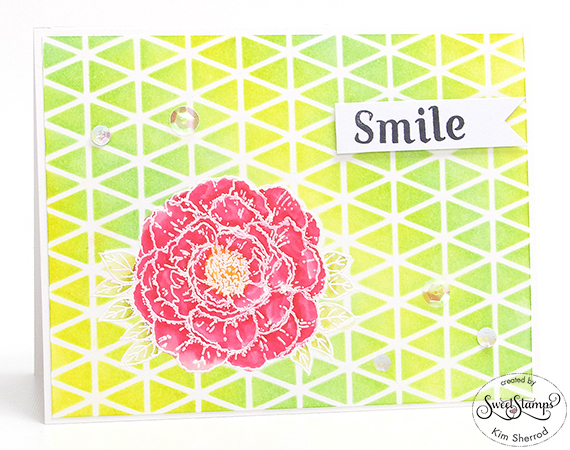 I then created the background using Sweet Stamps' Tangram art stencil in shades of Dandelion and Montego Bay. I created a mask for the cabbage rose using a piece of post it note. I colored in the image using a shade of yellow, green and red. I used a water brush to distribute the colors. The sentiment is from the Keep Calm set. I freehand the banner and adhered it onto the card using 3d tape. I felt it needed something so I randomly added some rhinestones. I made a mistake of swiping the red ink with the first card below and it smeared a bit onto the stenciled background so I ended up with two cards :) The top one I placed the stencil in a different direction.